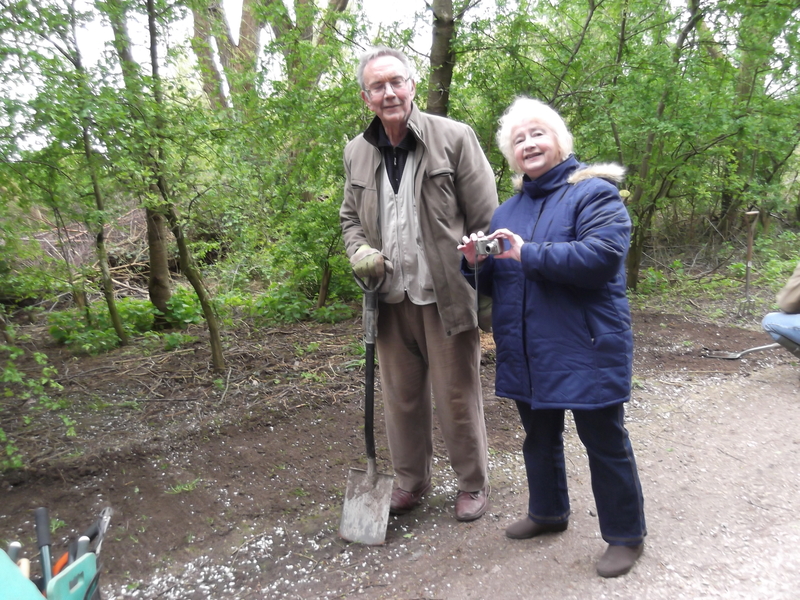 We had 6 volunteers for our Third-Thursday-of the Month session in April, and managed to lower the level of the soil beside one side of the path near Little Hob Moor to facilitate drainage off the path. Later in April Malcolm carried out a similar process on the other side of the path. Both areas have been seeded with a grass/short wild flower species mix. The east side was watered in by hand (in the absence of immediate prospect of rain! ), but rain helped for the western side. Louise managed to catch Pam Brown on camera for once (below, Pam takes most of our pictures usually). Pam had been raking back soil, shifting woody litter and spreading seed too on this occasion. It was great to see Luke and Douglas out again as well, and Paul Abbott. The path restoration session followed one planting more foxgloves, and red campion, selfheal and yarrow, after first clearing the excessive amount of dried out woody litter, near Nelsons Lane. April got off to a bit of a mixed start, but mostly good. Now the fence has been painted we have been able to plant a yew tree near the gate and some foxgloves and English bluebells. We’re comparing bluebells planted “in the green” to those planted in autumn last year. 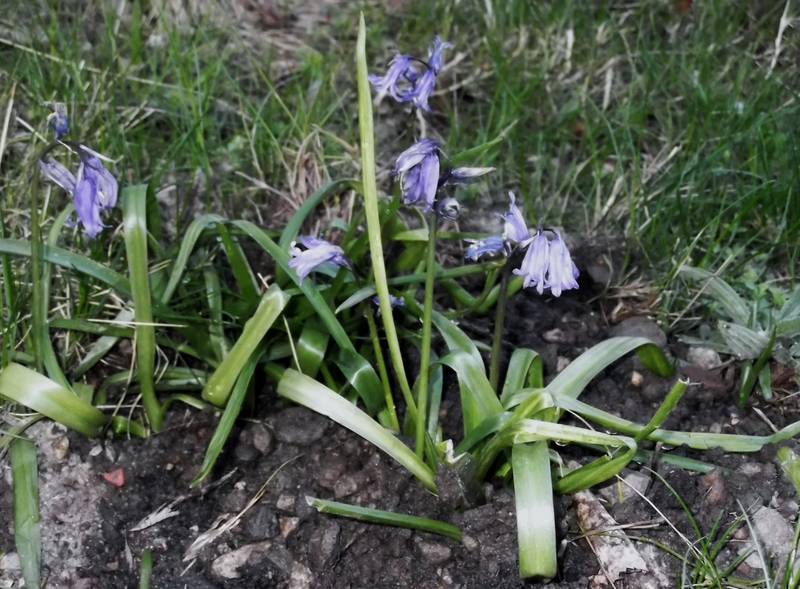 Regrettably virtually all the bluebell clumps immediately adjacent to Little Hob Moor and not planted by MCT are Spanish bluebells or hybrids, so will have to be replaced (see our Bluebell wars page for details). Our first-Sunday-of-the- month volunteer day was blessed by 15-degree dry weather and a turnout of 8. We were particularly pleased to welcome Julie and Lucy Brown to the ranks and Luke Burnett and Douglas Blackwood, who are working towards Duke of Edinburgh awards. With so many pairs of hands we made great progress in improving the area of Highways land alongside Nelsons Lane. A much better view can now be had of the trees, and wild flowers will be added soon. Sadly though, the night before, the freshly repaired and painted fence was vandalized and six slats were smashed. The local police looked into it. All’s well that ends well though, as a generous local dad, worried lest the vandalism had anything to do with aftermath of a family party, produced perfectly matched timber and replaced the broken slats. He did a great job and MCT are very grateful. 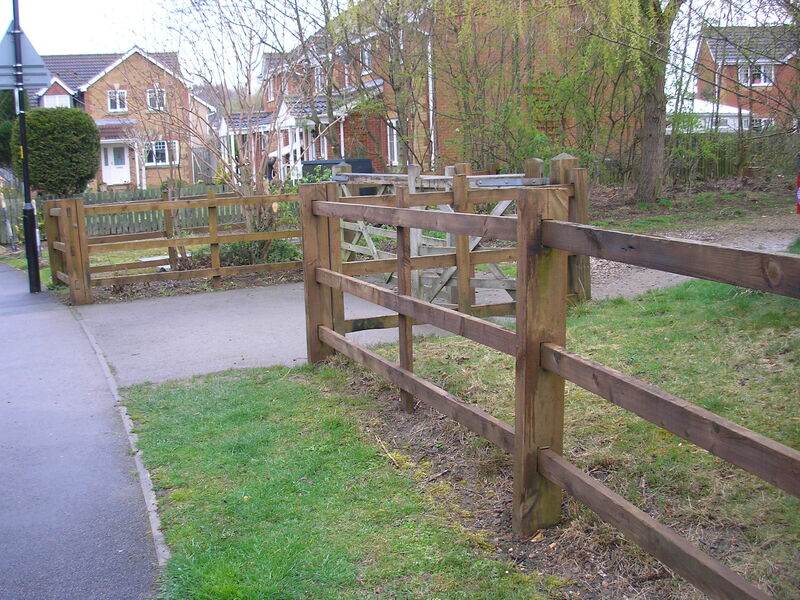 On Monday 24th March we enlisted the help of an enthusiastic and very conscientious team of 3 payback Community Service people and their supervisor to finish painting the fence along Nelsons Lane, after first trimming back the overgrown vegetation. We are grateful for their help and the excellent job they did, as you can see in Pam Brown’s photo below. The exercise was part of the York Spring Clean Week. 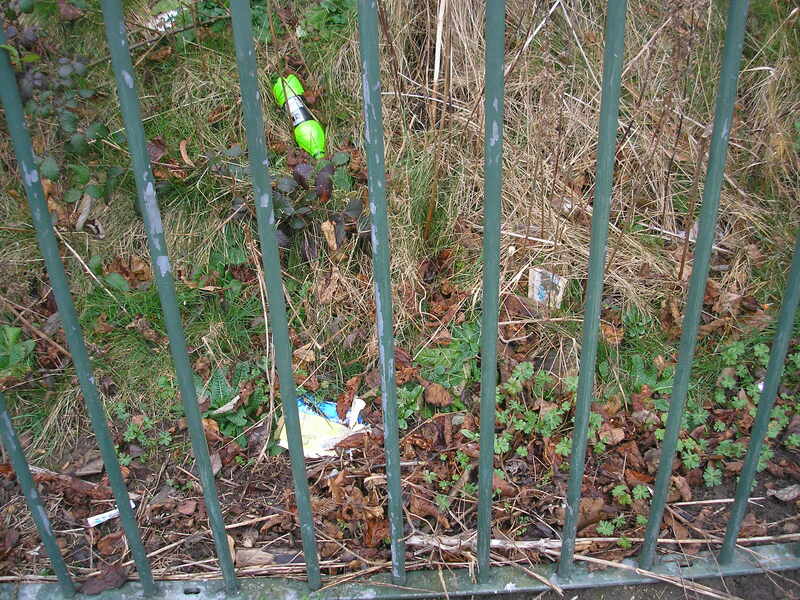 The treated fence either side of the Nelsons Lane gates is shown in the top photo on the left. Below that, the other photo from Pam Brown shows the start of the improvement of the playground equipment, using safe acrylic paint provided by CYC. This is not strictly in MCT’s remit, but an MCT volunteer took pity on the sole volunteer working for Chase Residents Association alongside Jenny Cairns of CYC in the misty conditions, and took some time out from scrub clearing to help out for a few hours. We were delighted at the weekend to see several clumps of English bluebells emerging from our autumn planting of 200 bulbs. We hope some at least will flower this year and plan to plant more. Many thanks to Paul and Lesley for their great help by volunteering to trim back the dense overgrown vegetation west of the gate, ready for fence painting and then some new planting soon. On the 17th March we finally managed to treat one side (not the road side) of the Nelsons Lane fence with a wood preservative, having waited first for a few consecutive days of dry weather. 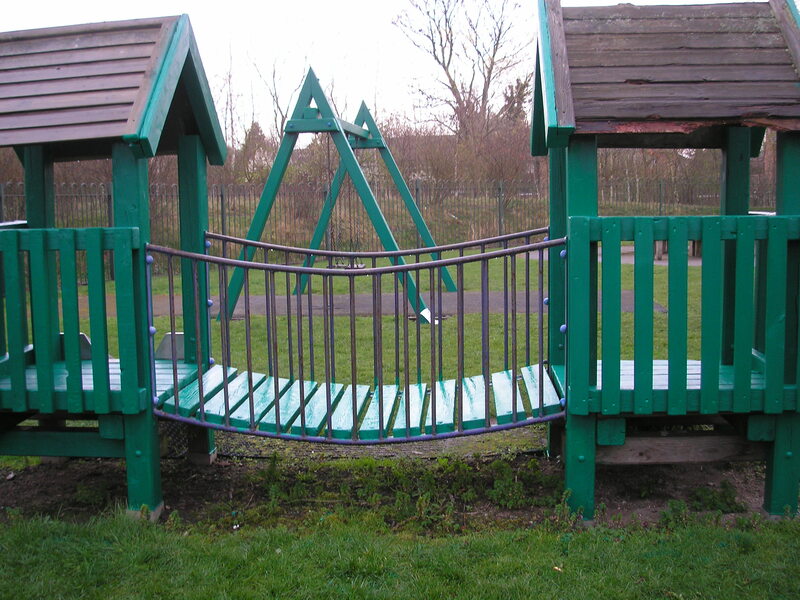 We are hoping to treat the road side of the fence from the playground to Hob Moor Terrace next week, weather permitting. Meanwhile, alas, that side doesn’t look as tidy as we would wish but it should look much better soon. We spent our regular 1st-sunday-of-the-month volunteer day on March 2nd clearing rubbish and brambles from around the outside of the childrens’ playground. 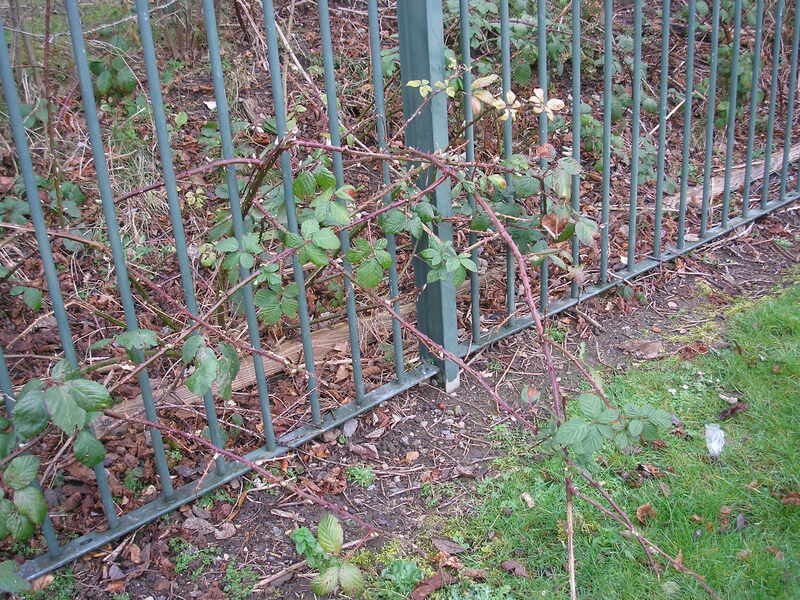 Litter gets trapped behind the railings but there was also a safety problem for children from prickly brambles and roses growing through. Pam Brown’s photos below illustrate the problem being addressed.